OCIN and SMOC will be presenting the 2018 Orienteering USA Nationals on Oct 19-21 in northern Indiana and southeastern Michigan. Many event details are here, including information on air travel, host hotel in South Bend, Indiana, plans for banquets on both Friday and Saturday nights, and more. We expect that online pre-registration will open in the next few days - we are still finalizing a couple of the extra items. What determines the sprint winner? Combined time? Do the sprint course lengths represent shortest legal running route or purple-line lengths? Are the expected winning times on the short side for sprints, since we have to run two of them? The sprint championships will be combined time for both sprints. We are still reviewing course plans, but the winning times are expected to be slightly to the short side. Both will be interval started, and your second start will be exactly 3 hours after your first start, so there won't be any big discrepancies in rest time that might happen if we mixed up the order or did a chasing start. The currently posted distances are straight line for draft 1. There have already been a few edits and more are expected; I'll work on "shortest runnable distances". We've done a couple test runs, more are planned. Will the two sprints be treated separately as far as ranking points go? Hmm, I think that's a question for the rankings coordinator. I'll pass it on in case she doesn't see this. The Rankings Coordinator says that it will not be a problem to rank both. So if you do all 3 days at the Nationals, you'll be able to get 4 ranked races (enough for a ranking) in a single weekend. Also, that means that a mp or dnf in one of the sprints won't spoil both of them for rankings purposes. And, if you wondering when the rankings will be updated, since I am a wee bit behind, hopefully it will be by Sunday. Something to do on Saturday on the long trip home. Are the map snippets in the header of the event page pieces of the actual maps being used? Trying to get an idea of what type of contours/how technical! Those are actual map snippets - and the same ones that appear in the event announcements in Orienteering North America and Compass Sport. Not all of the terrain is that technical, but there are some interesting and subtle areas. I'm not seeing any map snippets - what event page has the snippets? Which Green would F35+ be on? Wow, Valerie. The crazy mix of categories and trying to crosswalk it to our class/color scheme makes my head hurt, and that's just trying to deal with who's running what within our family. I really appreciate all the work you put into the rankings! @furlong: I think it will make the most sense to put F 35+ on green A, with the F40+, 45+. I'll do a little analysis to be sure that's where it fits best. The A/B splits on green and brown were determined based on looking at the finishing times from past events. There were not any F35+ entries in the previous national championship events that were used for the comparison, so we'll have to pull a little new data. Apologies for the omission. How is it that the Sprint Nationals race is now longer than the Middle Nationals race? Is this something that Rules and Sanctioning have approved? Was a waiver required? Does anyone want in on a one-way car rental, arriving O'Hare, departing Detroit? It's pricey but saves a lot of driving. I'd say on the order of $100 per person for the weekend. I can deposit you in your hotel, assuming the hotel isn't far out of the obvious way. Tundra/Desert, I'm currently contemplating flying in/out of DTW and renting a car from there. I think I'll mind the longish drive less at the front end. 1. Use distinctly different terrains and/or styles of course setting for each, so that the two taken together test a wider range of skills. 2. Make each course about 2/3 of normal winning time, so that it's not too exhausting, amidst a weekend of other back-to-back hard race days. 3. The qual/final format is something that national team athletes must prepare for at WOC, so this would be in keeping with that. 3. Except they usually don't do qual and final 3 hours apart, do they? Ideally, the total of times on both courses should be what one would typically run on a single sprint. If I run ~22-25 minutes (compared to *winning time* of 12-15) then if my total on the two courses here is around 25 or so I'll be happy. If it's 30-40 minutes, though, perhaps we need a rules change. Or make one Sprint the championship event, and the other one an optional "fun" event (with or without NRE status)? The time between the beginning of the start windows for the sprint qual and sprint final at this year's WOC was just under 6 hours. Fri/Sat Middle/sprints around South Bend. Long at Bishop lake Sunday. Assuming I have got it correct could you give some hotel locations close to Bishop Lake for Sat night (Ann Arbor?). I have booked flights to arrive Det (Wayne) from NY (Westchester) 11.30 on Thursday and have booked car rental. If anyone wants to part share 3 hour trip to S Bend. (and then to Bishop lake on Saturday) let me know. I will stay close to Detroit airport Sun night for early flight back Mon. Ann Arbor would be the most fun to stay at - extensive dining options in a vibrant, walkable downtown, and not a terrible drive to Brighton Rec. There are hotels near the mall (Briarwood), which is orienteer walkable (3 mi) to downtown A2, or Washtenaw or Plymouth exits off US-23 (between 3 and 4 miles). Perhaps someone more familiar with the west side will chime in. Not sure about closer in. I imagine airbnb is available if you're into that sort of thing. Parking isn't terrible if you elect to drive downtown. Garages seem to be the easiest. Either of the standard hotel chains in Brighton are closer to the venue (Lee Road exit on US-23 or Grand River exit off I-96). Brighton itself is nice enough, just a lot smaller of a business district downtown so less to walk around to. We haven't arranged any formal deals with hotels in Brighton or Ann Arbor. I'll try to put some info together, but I'm in pretty remote country for the next two weeks (read poor internet and limited ability to edit the event website). Best bet is to do a Google search or look at one of the travel websites. Brighton is closest and reasonably priced - if you want to be more urban, then Ann Arbor would be good. Ann Arbor is about 30 minutes away. If you are a Hilton Honors Rewards member, you can check rates at those chains too for discounts (thanks to the work of Glen Schorr, it saves us an extra 10% sometimes over the AAA rate). Just an update, reminder that Pre-registration is open! The deadline for T-shirt and dinner orders is fast approaching. Any info about the shirt design? Short or long sleeves? T-shirts will be available through pre-registration. Shirts must be ordered by the September 30 regular registration deadline in order to guarantee size. Shirts will be $20 ($21 for XXL and 3XL). See the shirt design (coming soon). Please order shirts by Sept. 30 to guarantee availability. Mike is in a place with poor internet, so is unable to upload the shirt design. He'll be back on 9/23. Any info regarding lengths for Sunday? Walk to start about 1km on the road (almost no climb). The last day to register -- without late fees -- is Mon, Oct 8. Any chance of 1:7,500 for the older folks doing Brown A, many of whom have declining eyesight! For those that might wish to fly into Chicago's ORD or MDW airports, you can take a short L train ride from those airports to the Loop downtown. Then the South Shore train will take you from the Millennium Park depot to South Bend in about 2.5 hours where you might hook up with others for the weekend. Any update on the t-shirt design? I know it is going to be awesome!!! Orienteering USA Nationals -- and still no late fees! We are in the process of getting sanctioning approval to print Brown A at 1:7500 (at least for the Long). I just read a note from the Sanctioning committee that 1:7500 has been approved for the Brown A Long course maps (the only one discussed by the committee) at Nationals. Janet is correct. Brown A will be 1:7500 for the long course on Sunday. Course length and climb information has been updated on the Race Details page. 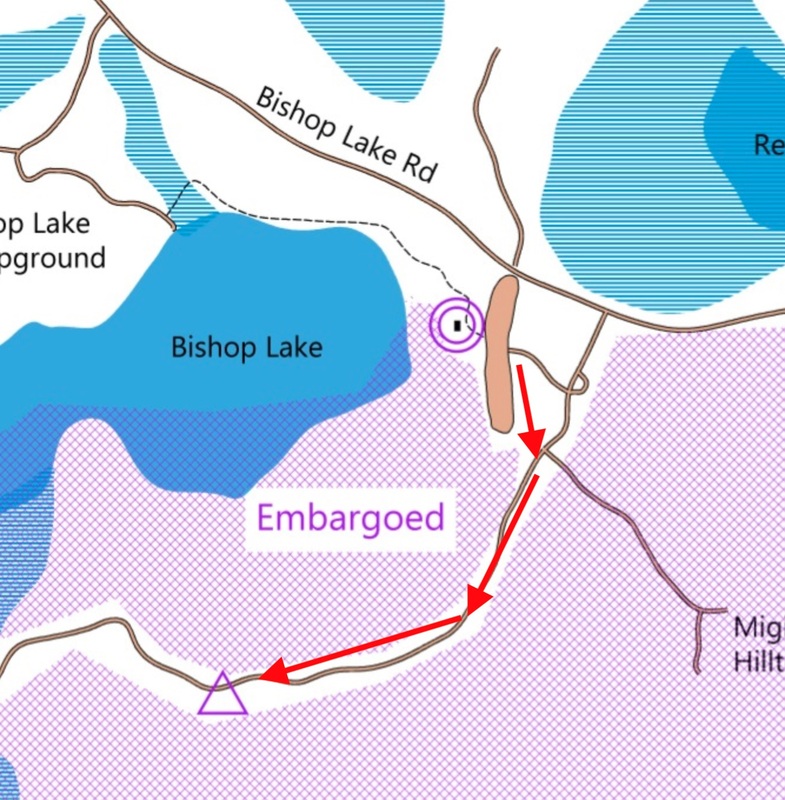 Some additional course and map notes have also been added. Registration is closed, but if you send a nice email to the registrar, we can probably get you in. Another quick note - in the online registration, we asked people to indicate if child sitting was desired. There were zero responses to the child sitting question. Therefore we will not be offering any formal child sitting. We have accommodated a couple requests for split start times, and our starter will be flexible with changes if needed. Are there old maps available somewhere? I think Ken Sr. found a map of the middle area online somewhere. From a recent event. I haven't been able to find it, but haven't tried super hard. The AP comments from those who attended that event are at least as valuable as a peek at the map. The long course map is posted in an attackpoint log. I bought mine as part of registration. Interestingly, it was just used for a score-o this August. Right, it was used for a score O geared primarily for Notre Dame ROTC teams. Those who ran in August are ineligible to compete this Friday (but could do a "recreational" course. Since ND is on fall break, there was very little interest from them in coming this weekend. By the way, I've had a couple people ask about metal studs on the Saturday sprints. Metal studs ARE permitted for the sprints. Thanks, Mike, for your comment. Was concerned about racers checking out the venue 2 months before the Champs. I would use studs, but I tend to use them more than most people. The ground will be soft from all the light rain today. White and yellow have a pretty high percentage of pavement but I'd use them an any advanced course. is the start tomorrow on Bishop Lake Rd.,? The start is on a park road, about one kilometer from the parking/finish area. There will be one porta-potty close to the start. Parking lot access is not immediately off Bishop Lake Road (unless you are human powered), rather turn in at that little junction just east, then there's a station at the little loop if you need a park pass (park says it will be staffed, there is also a self-pay stand if you get there super early), then hang the right towards the parking lot. I imagine this will be signed. Livelox for Long is posted, please add you tracks. Any LiveLox/RouteGadget for either/both of the Sprint courses? Great weekend of racing! Thanks to everyone who helped make it happen. Agree. This was quite a fine event. Excellent event, and quick results posting is appreciated! Thanks to all involved! Matt, thanks for having the splits up right after the races. Much appreciated! Many thanks to organizers and especially course designers and mappers! Fun and very different courses each day on high quality maps, reflecting the essence of each discipline! Smoothly run events and definitely place to come back in future! Thank you again to all who made it happen! How do you add a route to Livelox. I uploaded mine, but it only shows a Google map, not the competition map. Janet Tryson uploaded hers and I can see it with the competition map. Also, where can one find the final results? Evan, I just created an account, logged in, and uploaded a GPX file. I'll note that I don't see you listed on Livelox, only Janet. It is a bit inconvenient compared to RouteGadget due to the fact that you can look at only one route at a time, unless you pay $33 for a one-year subscription. Although it might be interesting to do that, it doesn't seem worth it considering that I have no idea whether there will be any other races in the next year that I'd use it for, and that's steep for a one-time use. Long looks like a Championship-class terrain, Middle --- definitely does not. Great event. Fabulous organization. Lots of fun. Thank you to all who worked to make it happen. There will probably be a Routegadget as well for the Long, please bear with us. SMOC has a club subscription to Livelox so it's a default for us. Congratulations on a good looking (on my screen) large project of deserving terrain. I cannot seem to find the results by class, only by course on AP. Can someone post a link? I think results will be posted here -- but they don't seem to be posted yet. Helpful hint - if you click on Latest Routes, you can get a separate link for a specific Route or Animation. Nice for pasting into your log. Brooke's link is correct and all results are now linked. Lost and found items include a pair of sunglasses (gold tint) and a 2-way radio, plus several items of clothing. We will be adding links to RouteGadget, Livelox, and photos. THANK YOU, Mike & Valerie!!! p.s. Does anyone have a photo gallery from the meet? I'd like to look for pics of RMOC people for our next email newsletter.